This is Oak Orchard's "Dual Purpose J-Cradle" 1.) Attach to your vehicle rack to transport your kayak with our J-Cradles. 2.) Wall Mount clips included; mount them to a wall and store your kayak in our J-Cradles! Be kind to your expensive composite, poly or wood kayak! The experts are paddlers here at Oak Orchard and know what it takes to build the ideal J-Cradle. Since the front and sides are padded, our Stainless Steel J-Cradles can used to secure one kayak on one side for reliable kayak transport AND convenient kayak storage. Notice the Stainless Steel construction with thick rubber padding and rubberized edge trim is great for plastic or composite kayak materials. These babies won't rust in a few months like those imported China cradles. Our J-Cradle has two mounts which can "straddle" the tower base - thus moving it "out" closer to you for easier loading! We call it the "Dual Purpose J-Cradle" -without a doubt, the best way to carry a kayak on it's side.... AND store your kayak on it's side! 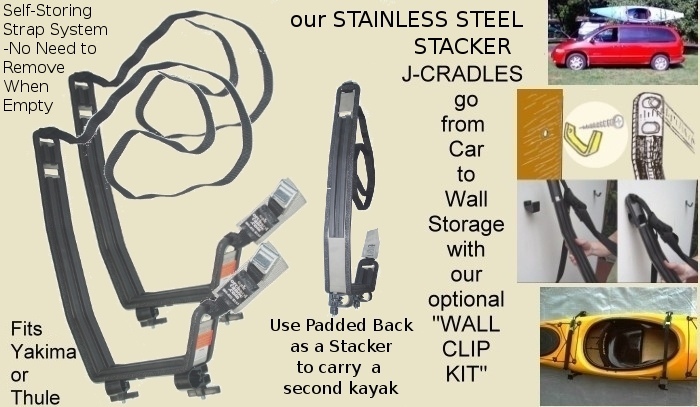 Use our J-Cradles to store your kayak on a wall with the Wall Clip Kit. Kayaks are less likely to dent when carried or stored on their stiffer sides! Includes two patented - easy load - no step stool required - hull straps!